I managed to squeeze in a cooking class the night before leaving for Vegas. I had a million things to do and a massive headache, but I was determined to learn how to make Chicken & Shitake Mushroom Potstickers, Peking Style Duck with Hoisin & Mandarin Pancakes, Vegetable Spring Rolls and Chinese BBQ Pork Buns. Chef Dio taught the class at the co-op and it was just a reminder of how much I like his teaching style. 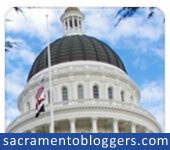 Super laid back and very knowledgeable – but doesn’t need to prove it every second with culinary speak. Love that! I used my iPhone, didn’t bring my new camera and wow can I tell the difference. I thought the big camera would be too distracting – trust me, I am the ONLY ONE taking photos in the class. People at my table are usually done with their samples while I’m only on my 5th or 6th shot of the dish. The life of a food blogger, LOL. 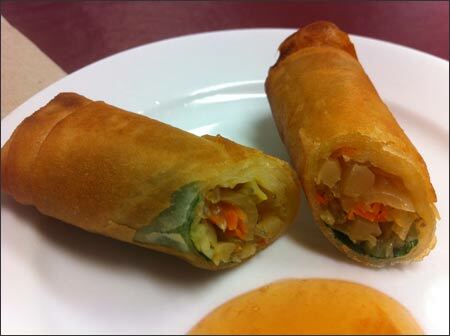 First up, Vegetable Spring Rolls –I should add “Incredible” to the title – they were so good! Fresh Water Chestnuts – 2 sliced or sub with canned – 1 small can fresh water chestnuts chopped. 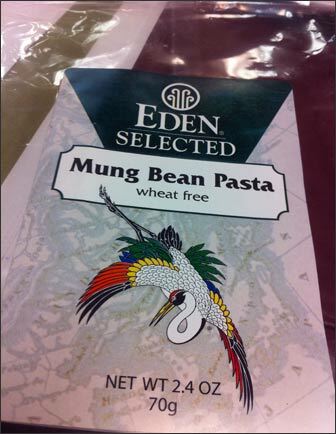 Soak bean thread noodles in hot water until pliable (About 15 minutes). Drain and cut in half using scissors. 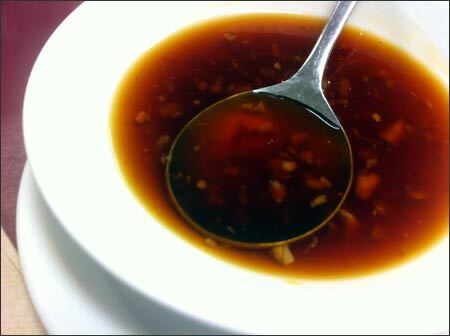 In a small mixing bowl combine sugar, sherry, soy sauce, cornstarch, and sesame oil. Set aside. Preheat a large saute pan or wok and add a little oil for stir-fry. Stir-fry mushrooms, carrots, cabbage, yellow onion, water chestnuts, and bamboo shoots for 3-4 minutes until cabbage is tender. Add garlic and stir-fry one more minute. Stir in bean thread noodles. Add salt and pepper and liquid mixture from the first step and cook until sauce thickens. Taste for seasoning, remove from pan and cool to room temperature. Place wrapper on work surface with a corner pointing towards you. Place 3 tablespoons of filling just below the center of the wrapper in a straight line. Fold corner nearest to you over filling and tuck it in tightly. Give the roll one tight turn, bring in the sides (so they won’t burn) and place one cilantro sprig on the inside of the roll. The wrapper becomes transulenct during the frying and you can see the cilantro sprig through the wrapper, it adds that extra touch. Continue to roll tightly and seal the remaining side with the flour/water mixture. Place seam side down on flat tray and make sure you keep rolls from touching. Roll the entire package of wrappers. Heat 1/2 inch of oil in skillet to 350 degrees. Carefully place as many rolls into the pan without crowding and cook for 4-5 minutes on each side until golden brown. Remove from oil and drain on paper towels. Serve immediately with sauces. 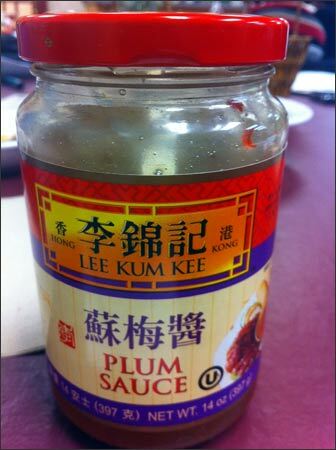 Lee Kum Kee was the plum sauce used. He mixed up the hot mustard before class and gave us a recipe for the garlic sauce. The garlic sauce was amazing! I’m definitely going to use it on vegetables and probably anything else I can think of, ha! In a small sauce pan, combine all ingredients and mix well. Heat on medium heat until sauce has thickened, stirring frequently. Cool to room temperature before serving. The recipe was labor intensive, but the good thing is that you can make them 2-3 weeks ahead of time. Place the finished rolls onto a plastic tray, freeze and then store in Ziploc bags. When you are ready to eat, place frozen rolls right into the hot oil. You could also fry 1 hour before company arrives – then re-warm in a 350 degree F. oven for 5-6 minutes before serving. I remember cooking an Asian dinner for friends back when I was with Ace. I think we ended up eating around 10:00 p.m. – definitely takes some planning to get the timing right. 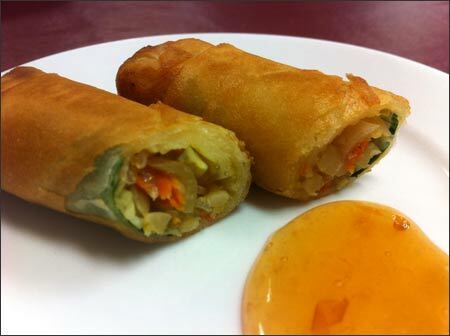 Have you ever made your own spring rolls? That looks really good! I am always afraid of “fried” foods because I tend to oversoak them and they end up all greasy and soggy. I need to learn how to not do that, oh wise one. gosh…i cant wait till you share the other recipes!! so why were you in Vegas? just for fun? sounds like a blast! Vegas trip was just a weekend getaway with the hub.